Now your little ones may play dress up and even co-ordinate with their favourite Alimrose dolls. 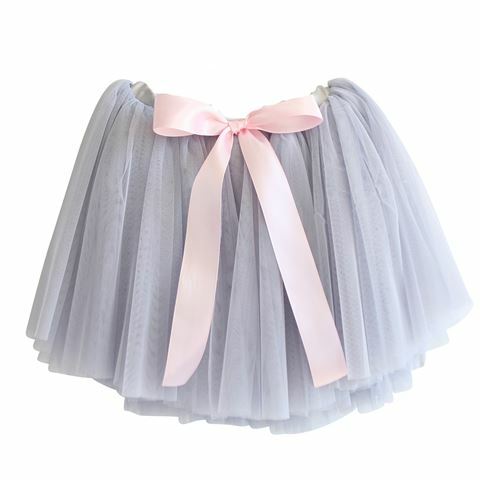 This Amelie Tutu in Mist Tulle is designed to fit over dresses or bloomers and is made of the softest fabric. It's finished with a big pink bow at the waistline. Alimrose has been making beautiful dolls and toys since 1985. With a passion for design and an eye for detail, you’ll want to keep them forever. The Alimrose collection of children's clothes instantly transforms little girls into princesses and fairies. Soft mist tutu to be worn over a skirt or bloomers. Big pink satin bow at the waist. Size: One size fits all from 2-to-6 years. .